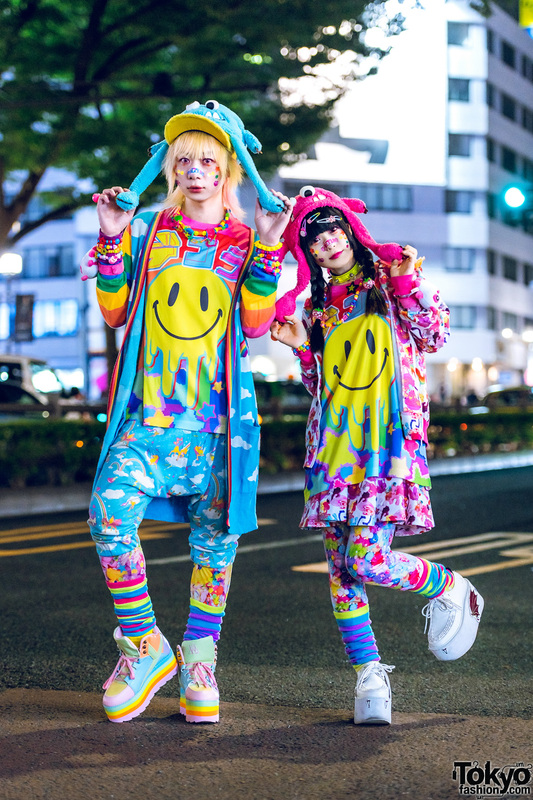 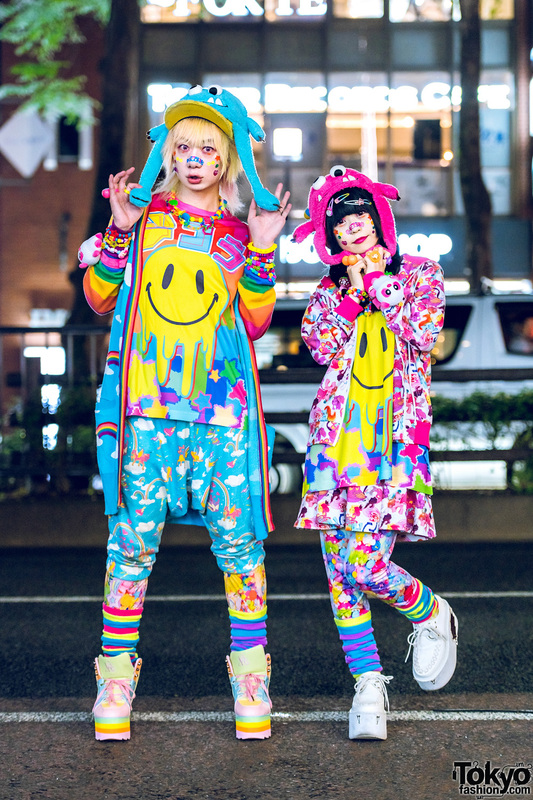 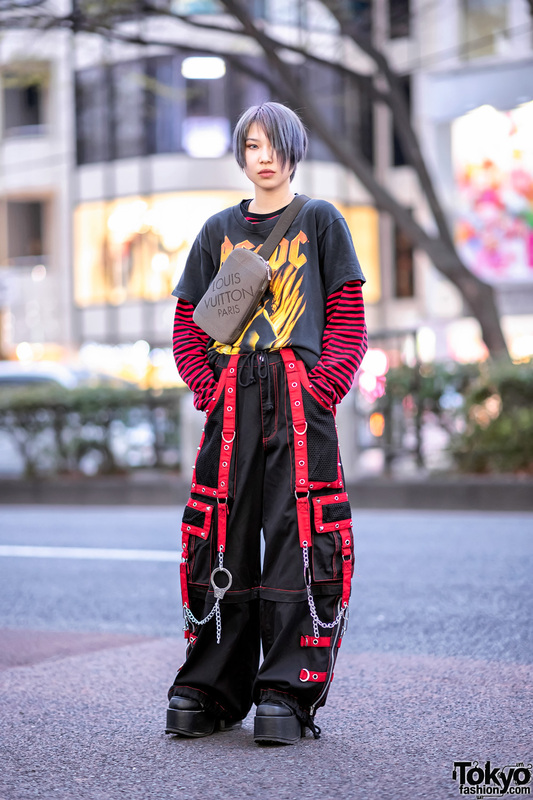 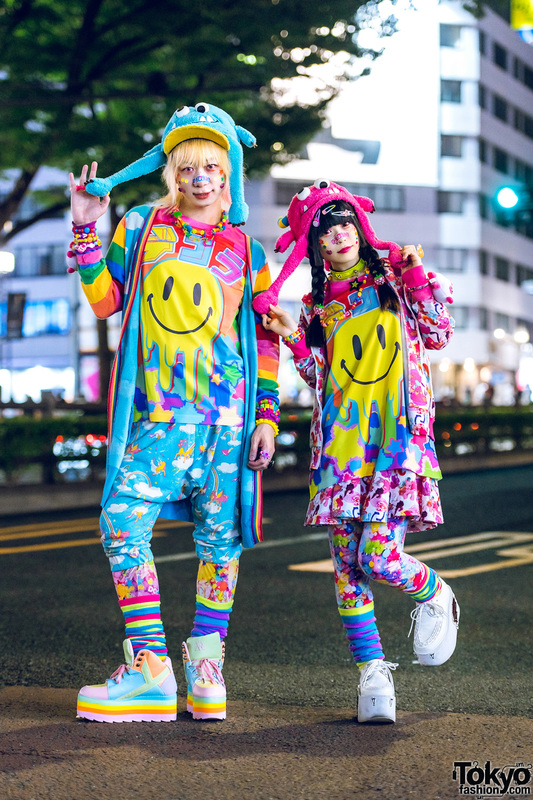 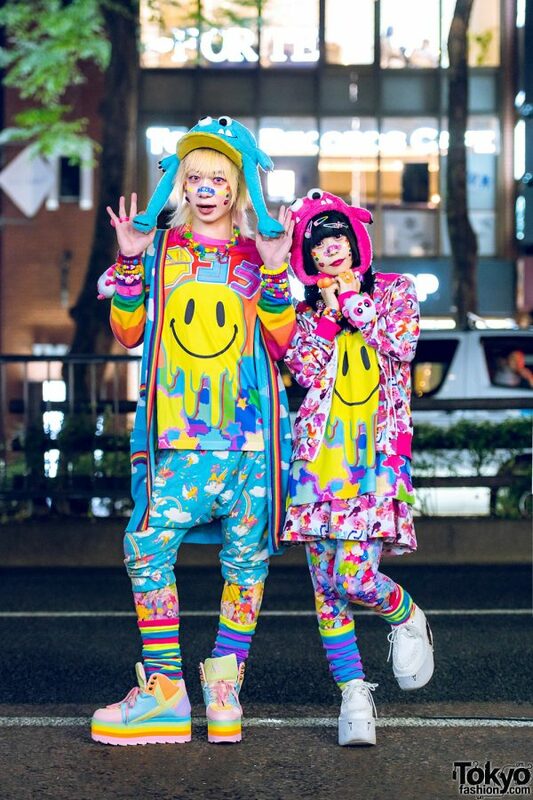 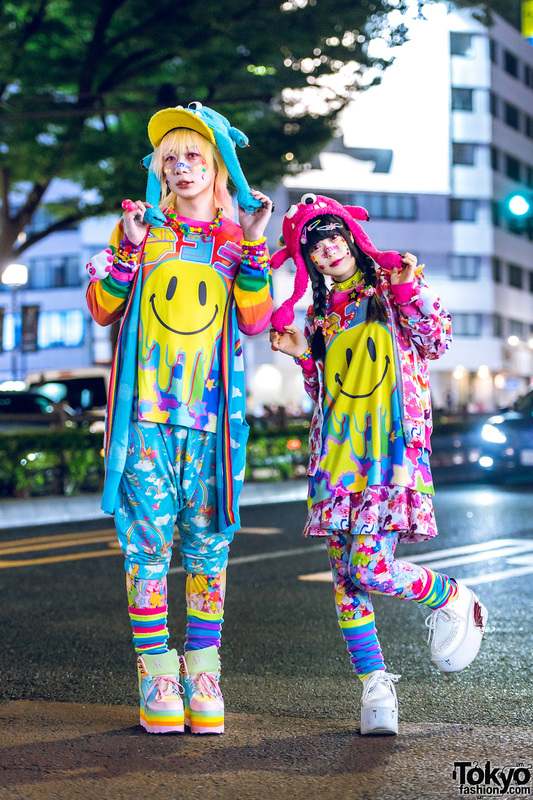 We ran into Junnyan and Yukachin – wearing colorful kawaii streetwear ensembles – on the streets of Harajuku street one fine evening. 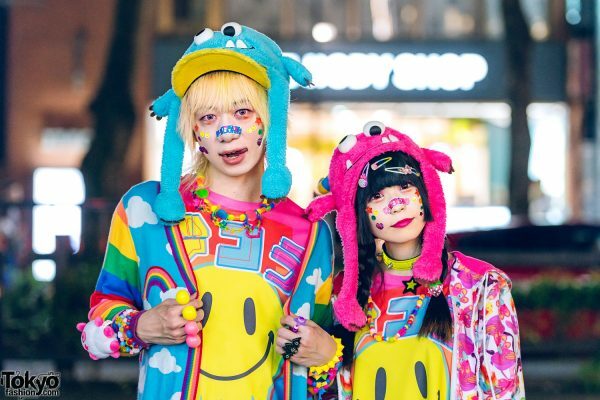 At the left is Junnyan, the Harajuku Fashion Walk organizer. 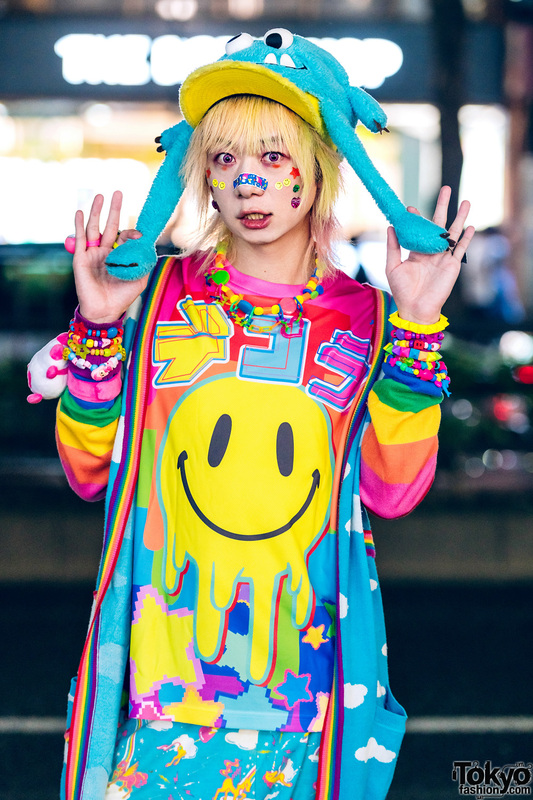 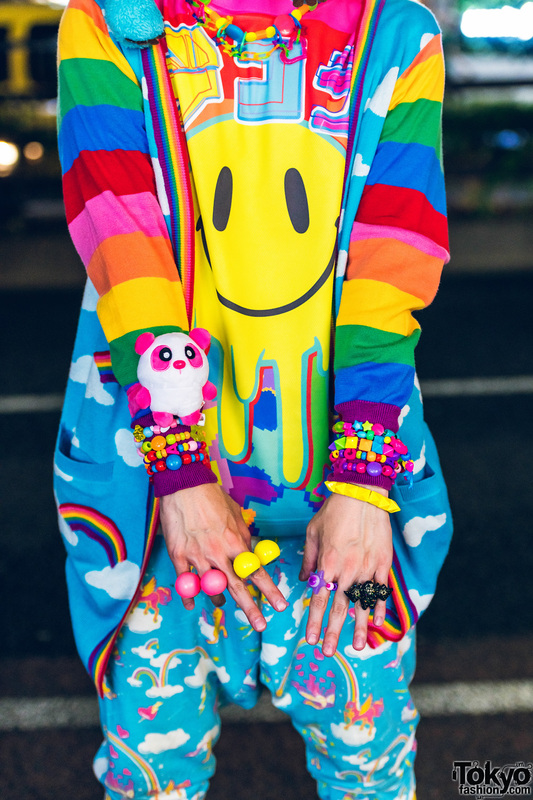 He stepped out in a Galaxxxy cloud print long cardigan with rainbow sleeves, worn over a smiley face printed shirt from his own brand, Aesthetics Clothing. 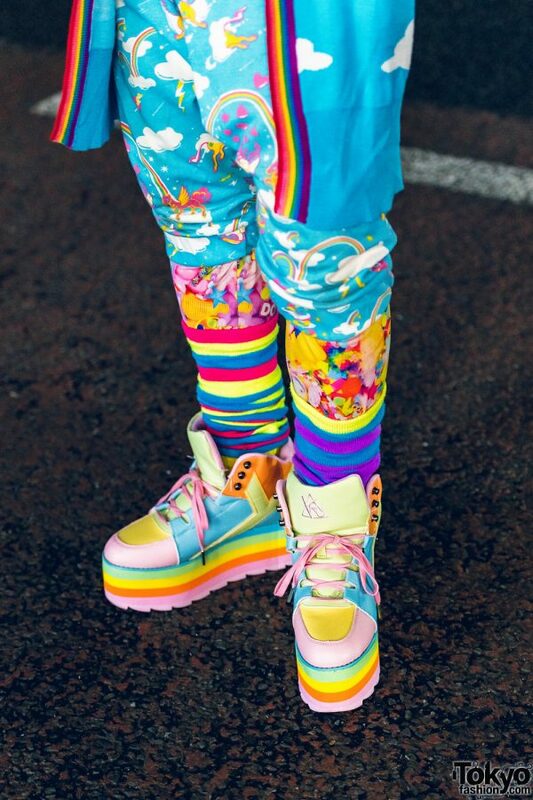 He donned blue drop-crotch pants with unicorns, clouds, rainbow prints and rolled-up hems, worn over candy print leggings, both of which are from kawaii fashion brand, 6%DokiDoki. 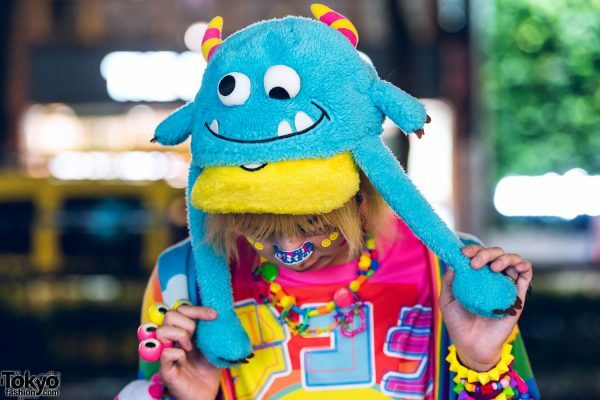 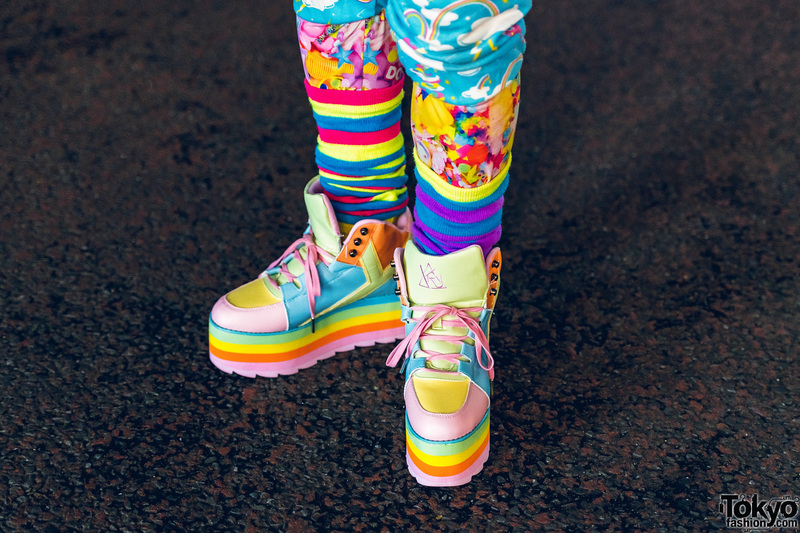 Mismatched rainbow socks, platform colorblock pastel shoes from YRU, and kawaii accessories such as a blue and yellow fuzzy monster hat, colorful face stickers, beaded necklace, stacked bead bracelets, and colorful cocktail rings rounded out his kawaii style. 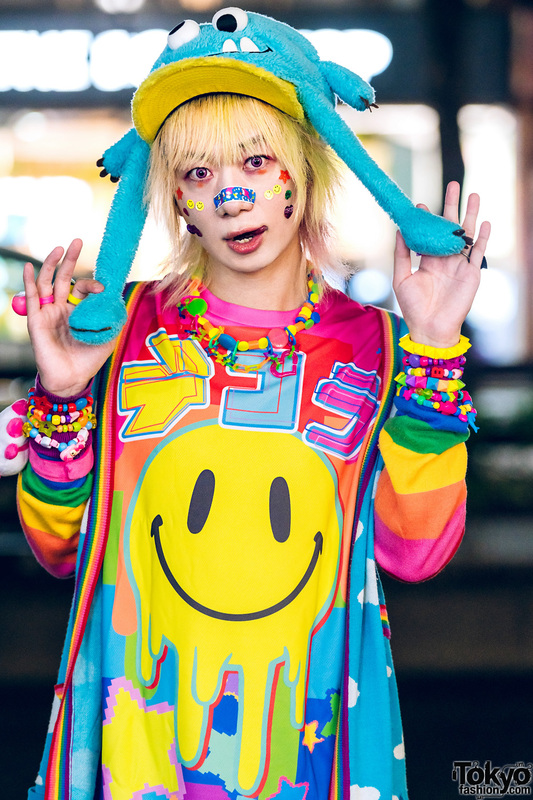 Junnyan likes the music of Miyavi, and he is active on Instagram, Twitter and Tumblr. 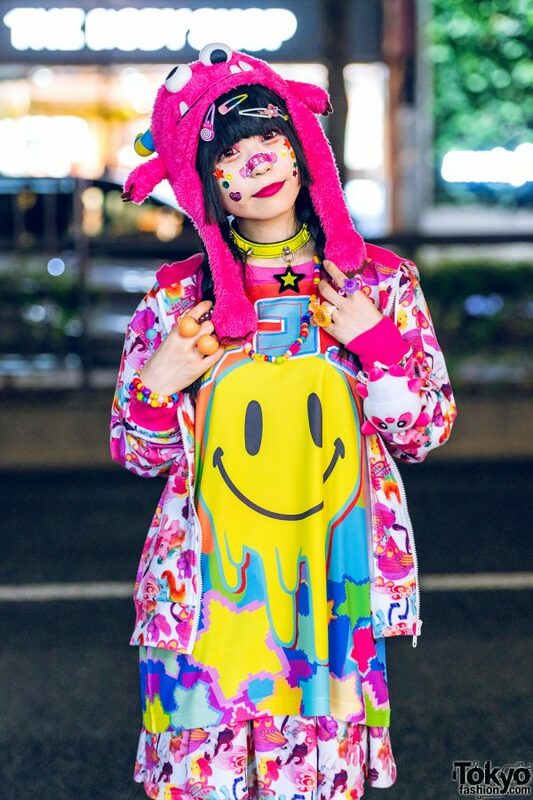 Meanwhile, Yukachin is wearing a unicorn print jacket from Poneycomb Tokyo, styled with an identical Aesthetics Clothing smiley face print shirt. 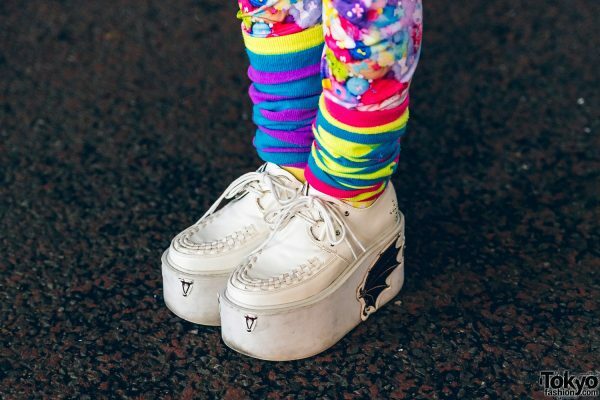 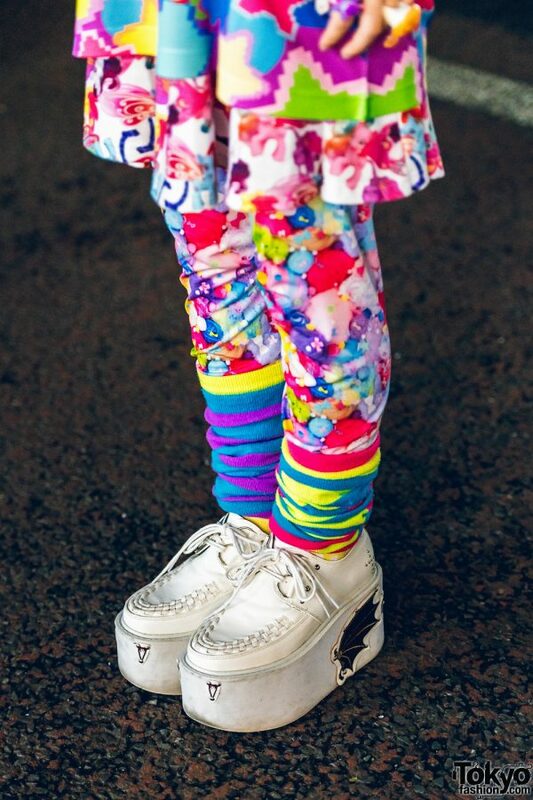 She wore a skirt with matching unicorn prints from Poneycomb Tokyo over candy print leggings from 6%DokiDoki, donned mismatched rainbow socks, and white platform creepers from Yosuke. 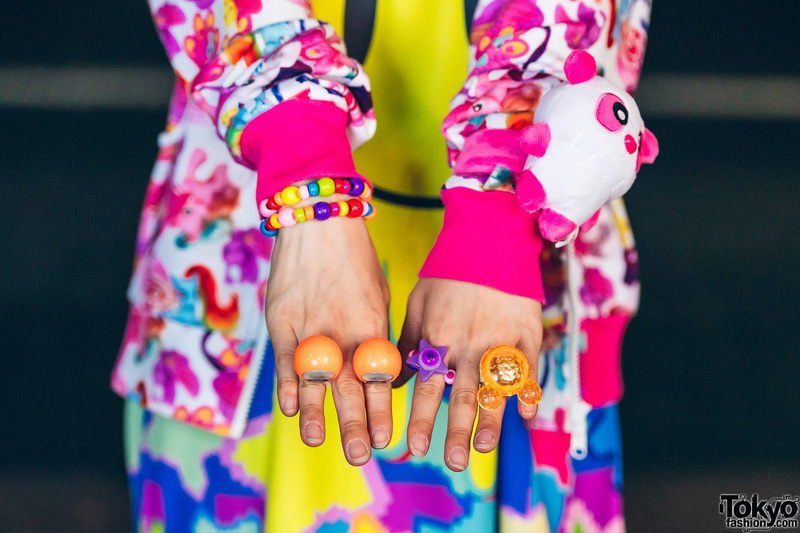 A pink fuzzy monster hat, decora hair clips and ties, a yellow leather choker layered with a colorful beaded necklace, stacked beaded bracelets, a cute plushie cuff, and cute rings finished off her colorful ensemble. 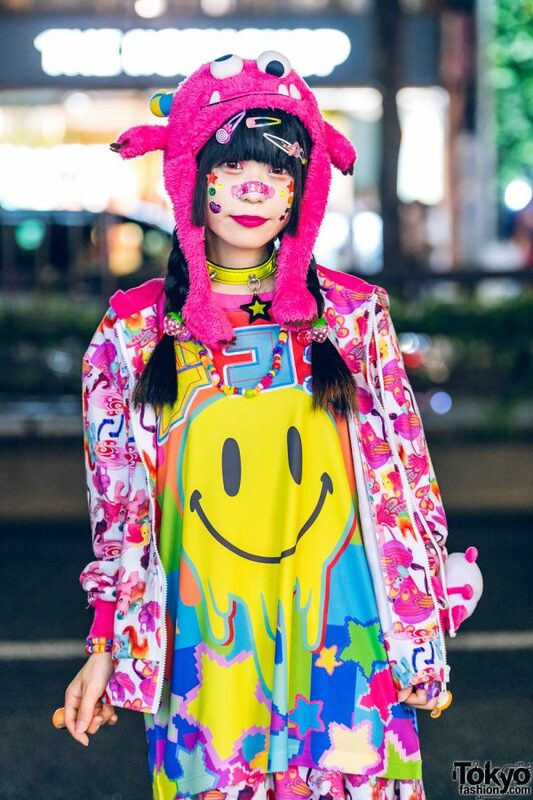 Yukachin’s favorite fashion brand is BlaBla Hospital, and she also likes the music of Miyavi. 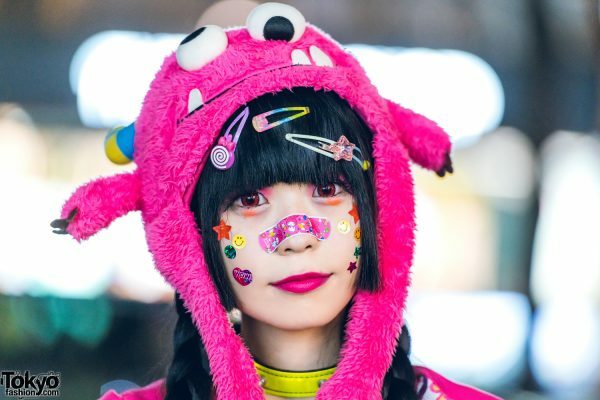 Yukachin is also active on Instagram, follow her!